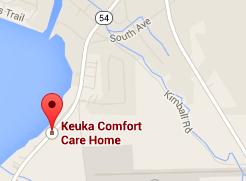 The Keuka Comfort Care Home is located at 35 Rte. 54 East Lake Rd. in Penn Yan. Click here to view map. The house is located just south of the village limits. Our mailing address is P.O. Box 107, Penn Yan, NY 14527.